Its been over a month since we have had some great weather. This past weekend the humidity dropped and the temperatures were in the low eighties. Finally we could work on the yard. Chris spend most of Sunday weeding her gardens. I was able to mow the yard and spray some seed killer on parts of the lawn that needed it. As Chris was working cleaning out over grown wild grape vines, she accidentally discovered a ground nest of Wasps! Thankfully she did not get stung. I do think Simba might have, but he is fine. The swarm was relatively large and I knew I would have to deal with it after sunset. After finishing up the yard work we got cleaned up and ran some errands. We needed some fresh produce for dinner and the upcoming week and I needed to get some Wasp killer! With the low heat and humidity I was looking forward to spending some time out on our deck. I think the last time we hung out comfortably was early June. Chris had started preparing our dinner and I had removed the cover to the grill and opened up our umbrella. Even though it was nice out it was still a little too hot to eat outside. 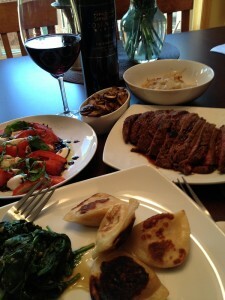 This night we were going to have Steak on the grill with a Caprese Salad, cooked Spinach and a potato pot-stickers. I knew we would need a nice bottle of wine to enjoy with our dinner so I wandered down to the cellar and spent some time both pulling bottles and putting them back! 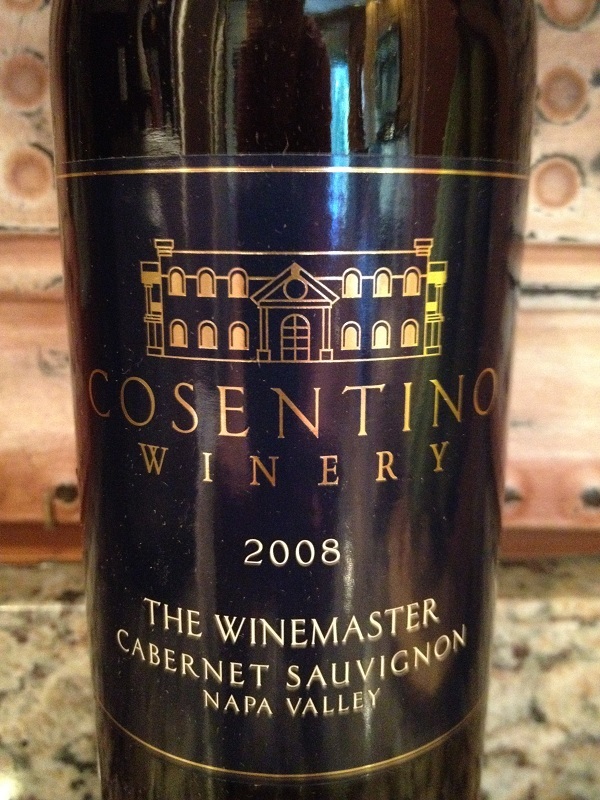 It had been some time since we have enjoyed a Cosentino Wine so I needed to figure out if it was it going to be a Poet, Winemaster, Cabernet Sauvignon or Estate Merlot! It did not take me to long to decide that we were going to have a Winemaster. We have various vintages of the Winemaste in the cellar. Since the 2008 was relatively young I decided this was going to be the lucky one today. I grabbed the bottle and ventured back to the kitchen. Since Chris was still preparing the meal I decided to put the 2008 Winemaster in the refrigerator for a bit just to cool it down slightly. When she was finally done preparing dinner and I helped by starting the grill and bringing out the steak. We both hung out outside as the steak was grilling and just recapped our day. Earlier that afternoon Michelle had stopped by for a nice visit. The steak was done and Chris brought it in to rest. We usually let the steak rest five to ten minutes so that when we cut into the steak all the juices remain intact. As the steak was resting I grabbed the bottle from the fridge and pulled the cork. I poured us both a glass and I gathered my tasting notes for the 2008 Winemaster before we ate. As you can see the it had a nice Garnet hue to it. The color depth was deep and there was no sediment in the glasses nor the bottles neck. It was time to smell it. 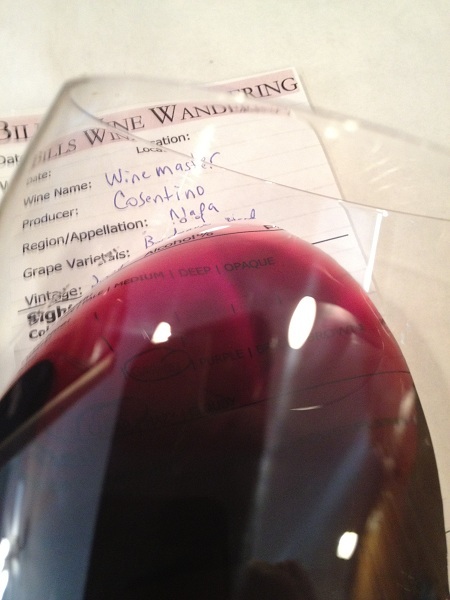 The 2008 Winemaster was very aromatic and you could tell the fruit was young. Some of the aromas noted were Blueberry, Blackberry and maybe a bit of Bilberry. If I hadn’t known that this was a Cabernet Sauvignon I might have thought it was a blend of some sort. I was looking forward to trying it. Tasting it – this was a full bodied Cabernet Sauvignon. The acidity was right on and the tannin’s were soft and medium. They were felt in my mid palate and the finish was long. The Winemaster was very flavorful! Some of the flavors we could taste were Cocoa, Caramel, Cherry and spice. 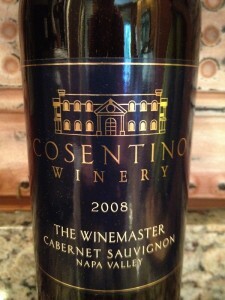 Mitch did an excellent job creating the 2008 Winemaster and Chris did a nice job with dinner! The Winemaster paired excellent with dinner. It was not hard for Chris and I to rate the 2008 Winemaster four glasses!